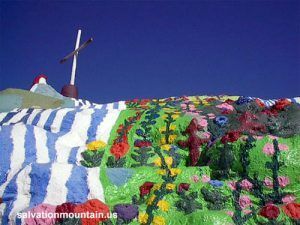 Just outside of Niland, California is a colorful artificial mountain made of adobe, straw, lots of junk, and thousands of gallons of paint. 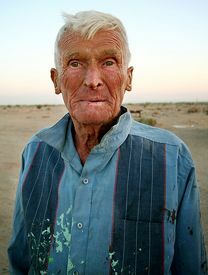 Created by folk-artist and religious man, Leonard Knight to convey his message that “God Loves Everyone.” Knight has been spreading the ‘word” for more than four decades but in 1985, decided to make a permanent statement by building a small cement monument on the side of a forgotten riverbank outside of Niland, California. Knight; however, was seemingly so enthralled with his small monument that he continued to build, enlarging it day by day, week by week, and eventually year by year. The monument continued to grow as Knight packed old junk he found at the dump onto the side of the “mountain,” then filled with sand and cement before painting it in a wild array of colors. After four years; however, Knight’s mountain crumbled into a heap of rubble, due to too much sand in the cement. But Knight was not discouraged, he learned from the lesson and began to experiment with native adobe clay, and mixing it with straw for more stability, began to build once again. Today, the mountain, which stands about 50 feet tall and about 150 feet wide welcomes thousands of visitors each year, who climb its wild rambling steps cut into its side to the summit which is topped by a large cross. The large “sculpture” includes not only numerous biblical quotes such as the Lord’s Prayer and the Sinner’s Prayer, but also sculptured flowers, birds, hearts, trees, waterfalls and more. The mountain includes more than 100,000 gallons of paint and more everyday as Knight continued to repaint and maintain his masterpiece. In the mid 1990’s, the artificial mountain was threatened when County officials declared it a “toxic nightmare,” alleging that tests claimed high amounts of lead in the soil. However, the locals rallied around the folk artist, circulating petitions to save the monument and garnering their own tests from an independent lab. When the tests came back with no unacceptable levels of any contaminants, especially lead, the mountain was saved. Knight continued to work on his monument daily, welcoming as many as 100 visitors each day. He lived full time at the site in a small cabin mounted on the rear of a 1930s-vintage Chevrolet two-ton truck. Like the monument itself, the truck and cabin are entirely covered with vivid colors and biblical quotes. We were informed by a reader who knew Leonard that Mr. Knight died February 10, 2014. The site also featured “The Hogan,” a dome-shaped building of adobe and logs filled with more biblical quotes. Knight’s later project was the “Museum,” which was to include several large domed areas built of old tires, logs, and adobe. 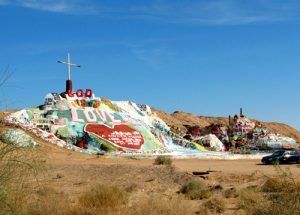 Although the project was never officially authorized and built on state owned land, Salvation Mountain was placed under protection in 2002 when it was entered it into the Congressional Record as a national treasure. Salvation Mountain is located on East Beal Road in Niland, California. There is no admission fee but donations are readily accepted.